Always a fan of a good button up shirt, this one piqued my interest for it’s unique print (reminds me of ballpoint pen scribbles you might make on a napkin as your mind wanders) and natural fabric (cotton/silk blend). As spring approaches, I think these lighter, airier fabrics feel nice to pair with your bulkier knits and outwear still in rotation from winter. I’m a fan of this fabric blend because you get a mix of lightness from silk, with a sturdiness and machine washability from cotton. For this reason, this Halogen shirt is one I check on every time Nordstrom gets a new crop of petite offerings to see if a nice print pops up I’d like to add to my wardrobe. More prints in this blouse can be found here (how fun is the navy dot?!) and here. 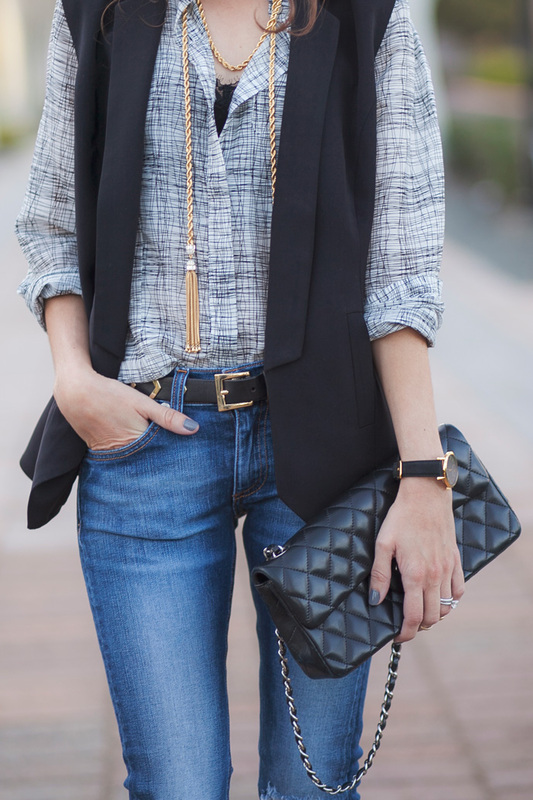 Love how a vest can so easily adds chicness to a outfit! Chic gold necklace too, the tassel design is beautiful! Is this your weekend style or work outfit? I’m starting in a similar field (Biomedical Engineering) and I’m definitely looking to you for jean/ heel inspiration. Thanks for the lovely posts. I love this casual chic outfit. I order the Halogen vest in both the black and white. Thanks to your post I just ordered the Halogen blouse. 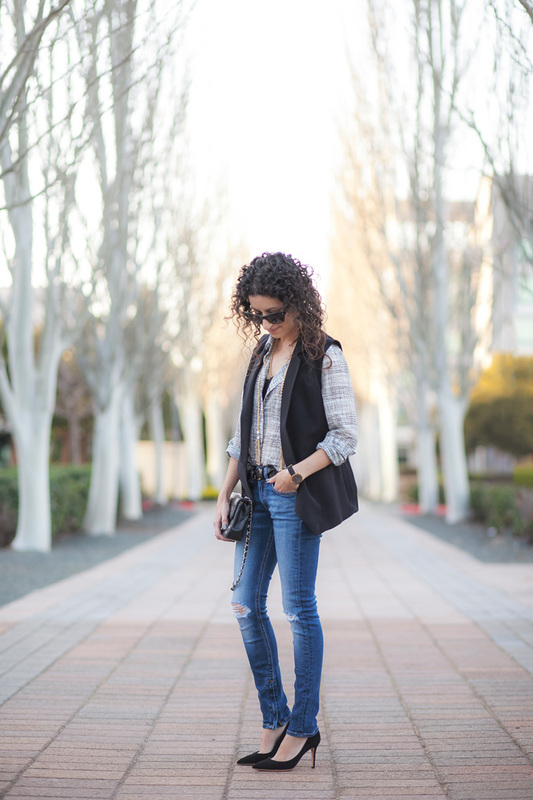 I hope we will see the vest again on your blog I need more ideas on how to style the vests into Spring. Thanks for all you hard work.Petite shopping is very frustrating. Thanks Renee! I hope you like them as much as I do! Have a great weekend!